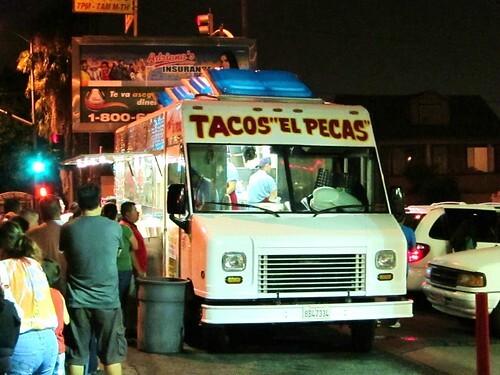 Tacos El Pecas parks in the lot of a do it yourself car-wash at the corner of 7th and Soto in East LA every night after 7pm. The car-wash turns into a de facto parking lot for patrons who use the hoods of their cars as makeshift dining tables. Cars pull in and out of the parking lot and police cruisers roam by and slow up to the line but it's unclear if they're looking for mischief or waiting for the line to die down to get some tacos. We’re just blocks from Hollenbeck, LA’s notorious gangland, but it feels safe, it’s a family atmosphere. On this night the line is at least 30 deep but moves quickly and it isn’t long before I’m second in line. It just so happened that the guy in front of me was a long lost friend of the kid taking the orders. Or so it seemed that way as the guy in front of me went on a hysterical rant about everything that had happened in his life since the two had last seen each other and then seamlessly shifted into giving the kid his order, an order that was so long it must have been for his entire family. As I stood there waiting I wondered if I wasn’t always on the move from taco truck to taco truck and if I had that one taco truck I frequented as a regular if I would have similar greetings. Maybe the taquero would remember me as a loyal customer, maybe he would nod or smile. Sometimes before ordering I would go into my own hysterical rant- maybe about the world cup, or the city or whatever and then I would seamlessly order my tacos and the taquero would say god bless this customer he is as loyal as my perro. But that is not me. 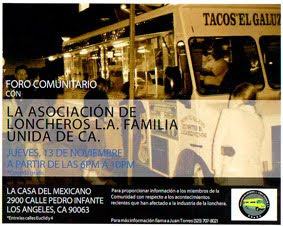 I am not a loyal taco truck patron. I am a transient taco reporter and because of this I will never have meaningful small talk with the taquero. When it was my turn I ordered asada, al pastor and suadero. I was surprised to find that the tacos were 75c each so with the extra cash in my pocket I added an horchata. The total for 5 tacos and a horchata was $4.75. The tacos are two biters, one if you care to try and they are delicious. The al pastor is cut from the spit, the asada and suadero(beef rib) grilled on the plancha then scooped up into tortillas and garnished with onions, cilantro, lime and radishes. 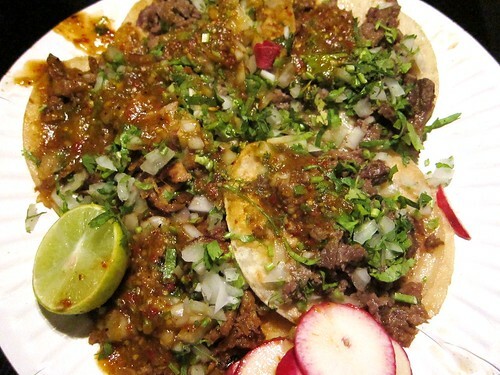 There’s a reason these tacos look and taste similar to El Chato, the current #1 truck on this blog . And that reason is El Chato at one time went by the name El Pecas #2 . I’m not sure if these two trucks are still affiliated but the tacos are very similar. There are some slight differences though. For instance El Chato serves grilled onions and a jalapeno with their tacos but El Pecas skips the grilled onions and jalapeno (I’m sure you could ask for a jalapeno). Also the El Pecas salsa is a little sweeter and darker while El Chato has a little bit more heat to it (though this may be due to the fact that the first thing I do when I get my plate of tacos at El Chato is chomp on the grilled jalapeno). Another difference is that El Pecas only offers Jamaica and Horchata as beverages while El Chato has horchata and bottles of jarritos and cans of soft drinks. Both El Chato and El Pecas serve classic LA street tacos- small tacos packed with meat, onions, cilantro and a chile salsa. I can’t say which is better. I live closer to El Chato so this was likely my first and last visit to El Pecas. Yes I must bid bon voyage to you tacos El Pecas. I’d love to stay awhile and get to know you but I am a taco reporter and the city awaits. "I am a transient taco reporter and because of this I will never have meaningful small talk with the taquero." A surprisingly poignant comment with larger implications about a journalist's role in society. OK, enough of that -- move on to the next truck, perro!